Who is ready for some tables and charts, huh? I'll try not to make this a boring exercise but by now you should know that I'm all about that Microsoft Excel life so I'm going to hit you with another number-heavy post on this site. 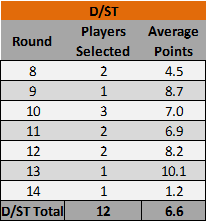 I was thinking about the draft picks that have gone well and ones that have not gone so well so far in 2014 and thought I would try to capture them in terms of positions on the field to see where we're getting points in relation to the rounds we selected our players. 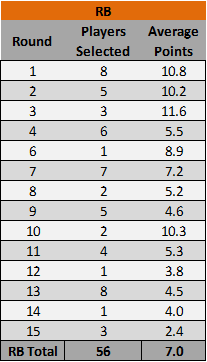 I took our 2014 draft picks, compared them to the average points scored by these players per game, and came up with a quick breakdown of how these positions are faring so far. I know these stats are only for seven weeks and everything you're about to read definitely could change but I also feel that week seven is a decent mile marker to gauge how our picks have performed and are likely to perform going forward. I'll break it down by position so I hope you scroll down with me and we learn just a little bit about how our draft played out. We'll start with our field generals to see where we drafted them and how they've performed so far in our season. Now let's move to the running backs. This trend line is a little steeper, which tells me that you can expect a sharper drop-off in points after the first three rounds. There is definitely a trend here as the longer you wait for RB's, the less points you can expect, especially when we start getting into the RB2-RB4 territory. I know that expecting less points from later picks is true for all positions but it seems to be more true for RB's than say QB's, TE's, D's, and Kickers. We've seen some nice third round RB's with Bernard and Ellington averaging nice totals, and then we fall off a little bit of a cliff. Round one would've been better if Peterson didn't get suspended and Martin didn't get hurt every single game. 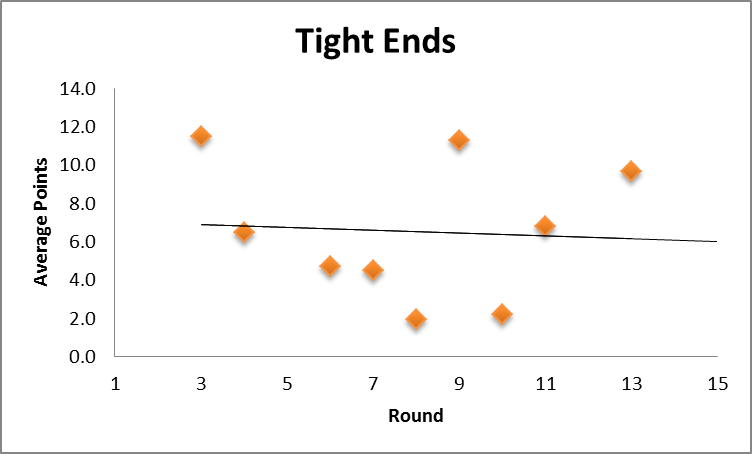 Lamar Miller and DMC have been worth every penny in round 10, which is why that spot is so high above the trend line. Now to the ball catchers. 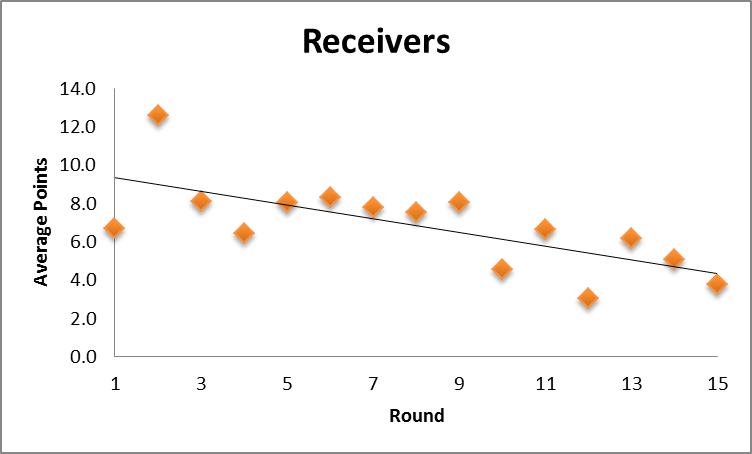 Thanks to some injuries to early round receivers, we've seen a little more range in terms of the average points for this group. 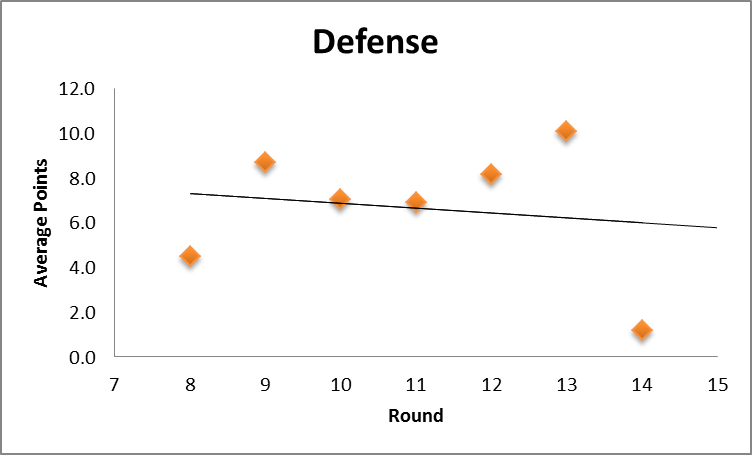 In the middle to late rounds, we saw a lot less variability as they more or less hovered around the trend line. Receivers in general seem to be less of a risk than running backs, which you probably knew, but it's also harder to stand out above the pack. 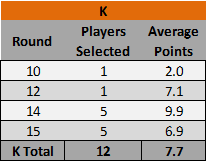 Round 2 was the most popular round to pick a receiver and it's played out great for the most part with Demaryius, Julio, Dez, Antonio Brown, and Jordy all piling up the points so far. Now to the ball catchers that also run block. Based on this tight end table and chart, it would seem wise to wait for a TE because there doesn't look to be much difference no matter when you pick one. That's not necessarily true though but there is a tight end strategy that rings true this season and it's either grab one of the top three guys (Graham, Thomas, or Gronk) and if you don't get one of them, wait as long as possible. Middle round guys like Vernon Davis, Whitten, C. Jordan, Jordan Reed, and Pitta have all been worhtless this season while waiting for Olsen or Bennett in the later rounds would've provided much more value. Basically, the top three guys are reliable and everything after that looks like a crapshoot. Now we highlight the D units. There are owners who love to fill out their rosters with a D/ST early and there are owners that like to wait and stream D/ST's each and every year in the Dirty Dozen. Sometimes taking an elite D/ST pays off but this is not one of those years. The Seahawks, Panthers, and 49ers were taken off the board in the 8th and 9th rounds and only the 9ers have returned anything close to expected value from those picks. Going into week 8 the top five D's were Detroit, Philly, Buffalo, Indy, and New England and only Buffalo and New England were taken on draft day. We've had this debate in this league enough that I don't need to break this down any further but 2014 looks like a season to wait for a D on draft day and stream matchups whenever you can exploit one. No matter what your strategy, there's always a chance you'll get burned with a D no matter what. Now to the most unpredictable position, the ball kickers. We've been playing this league for 14 years now and we still have owners that draft a kicker before the last round. 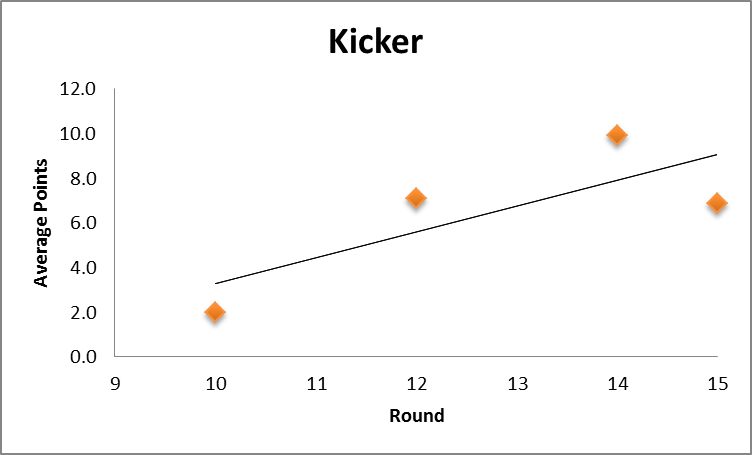 I'll blame booze for this as this chart shows that there is absolutely no reason to draft a kicker earlier than the 14th or 15th round. In fact, the average points scored has increased the longer you waited for a kicker this year. Outside of Gostkowski, it's pretty hard to know what you're getting from a kicker and this is further proof that you can find a random kicker late in the draft or in the free agent pool that will score as many points as 90% of the other kickers in the NFL. Now let's get a holistic breakdown of how our draft has played out. 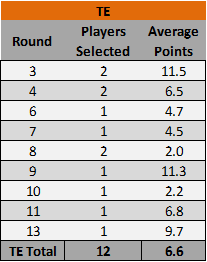 This table below shows the average points per round and per position for our draft. 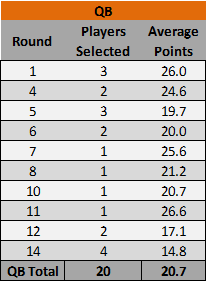 Here's one final table that shows the average points scored by round and position. Again, we're dealing with small number of picks per round, so the lesson isn't to wait for a tight end until the 13th round because you'll hit big on him, this is more of a broader lesson to be learned when it comes to pouncing on a position based on the round. 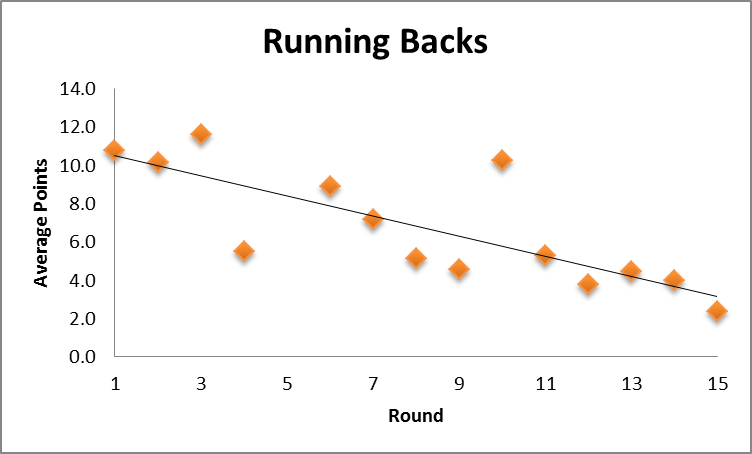 It certainly looks like you want to grab a legit running back or two early if you want to gain a RB advantage and the same goes with tight ends. 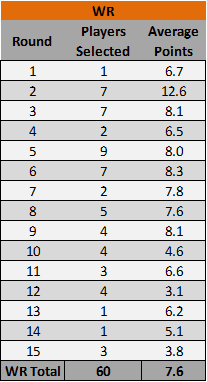 You can probably wait a little to grab a QB, D/ST, and a kicker based on what we've seen so far while you can expect a gradual decline in receivers as you work your way through the draft. Of course this is dealing with one draft for one league after only seven weeks of football but living in the present, this is how our 2014 D12 draft is playing out, which can't be taken incredibly seriously but also can't be ignored. 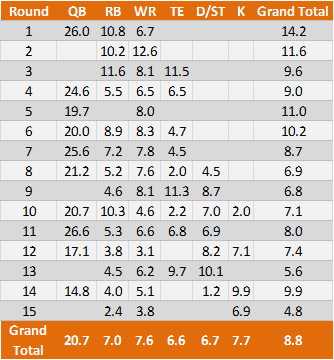 And finally, some visual proof of how much our draft picks are scoring based on their draft position. This is a scatter plot to show how many average points our picks are scoring based on the 1-180 picks we made on draft night. The average points scored is the y-axis and the draft position is the x-axis. 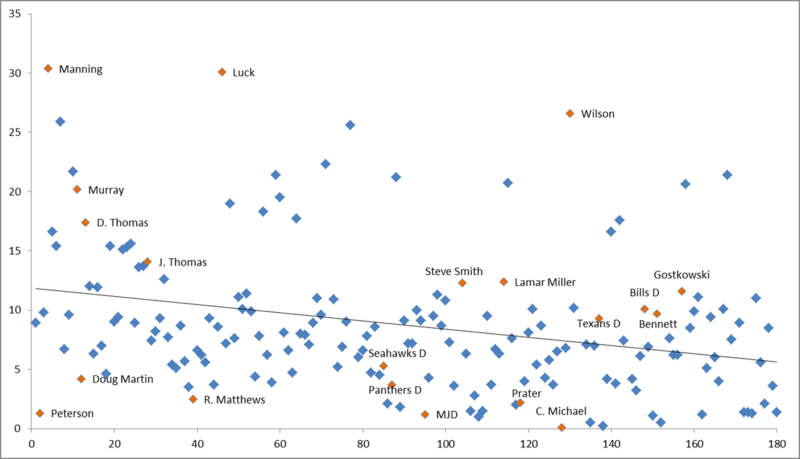 I've highlighted some outliers in orange so you can see who has far exceeded and failed to live up to expectations. 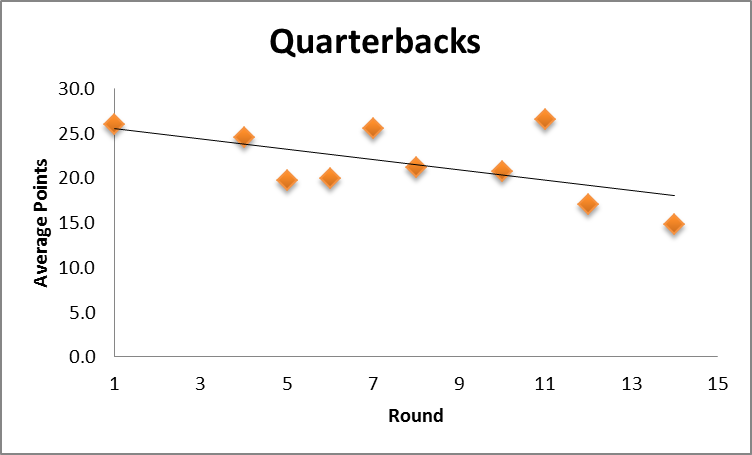 You can assume that a lot of the points around the 18-25 point range on the y-axis are quarterbacks for the most part. I hope this was a fun little look back at our draft day decisions and the trends that are taking place with their returns so far. Thanks again for enduring more excel exercises with me and hopefully more of your players are above the trend line than below it so far in 2014.